Last night Rose and I went dumpster diving and came home with our back packs heavy. The coolest thing was finding a bag full of toliet paper. We were down to our last role. It feels like God is leading us in his mysterious ways these days. 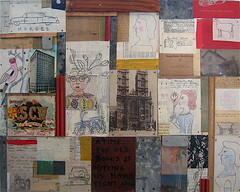 This collage cantains some of the elements that have been pulled out of dumpsters. To me, making art out of what has been discarded is a powerful message of redemption. After all isn't that what God has done for us, retrieve us from the trash pile and put us beside him in front of his father's throne? Brenda and I will be included in a show at Buckham Gallery in Flint MI which is a alternative space much like UICA here in Grand Rapids. We will be showing pieces like this which we are making together. It is difficult to work together like this but also very exciting to let go of some of the control and allow another person to take the steering wheel artistically. Please say a prayer for us that we will be able to have God speak through us in this work and touch people in a fresh way; perhaps even open up some hearts and eyes. Thank you.